Santa's Little Elves: Personalised letters from Santa Claus himself! Excited doesn't even begin to describe the reaction of my two when they discovered that Santa Claus had posted them a letter from his home in the North Pole! If you want to make Christmas even more special for your little ones, then you have to check out Santa's Little Elves. 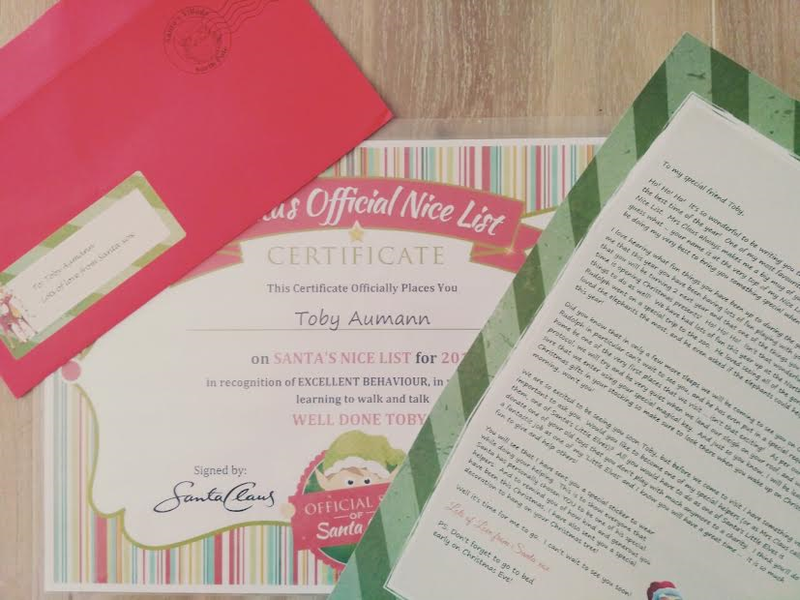 These guys are responsible for lifting the magic level of Christmas up a notch (or three), with their range of personalised letters and certificates from Mr Claus himself. For only $12.95 your children will receive a personalised A4 letter which arrives in an individually addressed envelope (cleverly posted inside a discreet envelope to you). There are 7 individual areas that you can personalise your letter to make it more suited to individual siblings. For example, describe where Santa will leave the presents at your home, what activities your child has enjoyed throughout the year and what Christmas activities they love to do during the festive season. You children will be amazed by just how much Santa knows about them - proof that he really is watching all the time! I love that in the letter, Santa invites the children to help him out by joining his team of Santa's Little Elves. As one of 'Santa's Little Elves', children are encouraged to help spread the true Spirit of Christmas by helping those less fortunate within the community. You get to personalise this too, and include a suitable activity such as donating toys or contributing towards the Wishing Tree. Santa also includes a few little Christmas gifts with each letter he sends, so expect a little Christmas sticker, decoration and colouring sheet too. My only word of advice with these letters is to film your little ones as they open their envelopes. I really, really wish that I had of done this as the reactions when they realise that Santa has sent them a letter truly is so priceless! To ensure you don't miss out this year, final orders for New Zealand readers are taken on 27th November 2016 with all letters dispatched on Friday 2nd December 2016. If you are in Australia, 3rd December 2016 is your final day to order with all letters heading out on Wednesday 7th of December. For a limited time, Santa's Little Elves are offering Utterly Organised readers the chance to save $1 off their personalised letters and certificates. Simply pop the code Christmas in at checkout to receive the discount off your purchase. This offer ends on 27th of November 2016, so make sure you get moving! Letters can be ordered here and certificates here. Thanks to Santa's Little Elves, I have a family set of Letters and Nice Certificates to give away! This includes up to 4 children per family set and will also include some magical sprinkles too! To enter, please follow the prompts below and please ensure that you follow the terms and conditions stated below. Entries MUST use the Rafflecopter widget and include a comment below this post as to how you like to spread the true meaning of Christmas at your house eg. donating toys etc. Good luck to everyone and a big thank you again to Santa's Little Elves for making this Christmas that little bit more special! These letters have been read countless times and have been treasured (and shown to friends and family)! Don't forget if you are in Melbourne and want to get along to the Santa's Magical Kingdom, I have a family pass giveaway that you can enter over here. It ends in just a few more days, so don't delay! For me, Christmas is a time to gather and spend time with my family members, parents, brothers, and other extended family. I usually either visit my parents & brother interstate or spend it at home and have a Christmas gathering & lunch with my cousin, and my parents will come & visit me instead. We exchange Christmas gifts with each other. I normally donate some gifts or money to charities to help others who are less fortunate & attend the Christmas mass. Our Christmas eve tradition is to walk the streets nearby looking at the beautiful lights everyone puts out. Often there is music, interactive displays, and even BBQ's happening. My 3 kids and I take some time the weekend before to write thank you notes to drop into letterboxes - some people put so much time and effort into their displays, that we want them to know that their efforts make our Christmas more special. We always hope it brings a smile to their faces on Christmas Day when they read them. I let my son pick out 2 toys, a girls and boys, from the shops to put under the kmart wishing tree. He has so much fun and puts so much thought into what to pick and he understand why we do it and that 2 children will receive these present on christmas and make them happy. Cant wait until my youngest is able to understand and help with the picking of gifts. For me, it's about reconnecting with loved ones. I try to do this by making an extra effort to disconnect from screens. Please ensure you pop your full name next to your entry as per the T&C's. Thank you! I always clear out the kids old clothes and toys for donation at Christmas time as well as making small donations to various charities.